The French Medicinal Chemistry Society (Société de Chimie Thérapeutique - SCT) is pleased to invite you to Rouen, for the 50th edition of the International Conference on Medicinal Chemistry. As per its tradition, the scientific committee will ensure the high quality and diversity of the scientific programme, together with the accessibility of the meeting to MSc and PhD students. For the latter, an advantageous registration fee will be proposed. Moreover, a special career session will be organised with industrial and academic participants. During the meeting the P. Ehrlich Lecture Award will be awarded to a researcher or a research team for his/her/their outstanding contribution to medicinal chemistry. Furthermore, the Pierre Fabre Award for Therapeutic Innovation will be attributed to a researcher having accomplished a decisive action or made a discovery contributing to a therapeutic innovation. In addition, a poster session will provide the opportunity for all participants to present their current results. “Best poster” prizes will also be attributed. Building on the success of 2013 in Nice, RICT 2014 is expected to gather 600+ scientists from around the world. 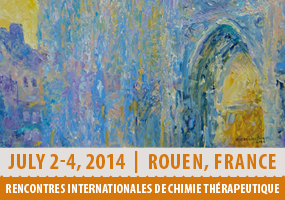 RICT2014 will be held at Rouen’s Law Faculty, a beautiful new building located downtown on the bank of the Seine River, and within walking distance from the Place du Vieux Marché (where Joan of Arc was burnt alive in 1431) and the famous Rouen Cathedral, painted by Claude Monet. We invite you to read the editorial of the symposium, edited by Professor Dario Nerio (ETH Zürich).